Lake Bled gets most of the attention of travellers to Slovenia and Ljubljana is very often forgotten. Only a thirty-minute drive from Bled, Ljubljana is Slovenia’s capital city and is one of Europe’s smallest capitals. 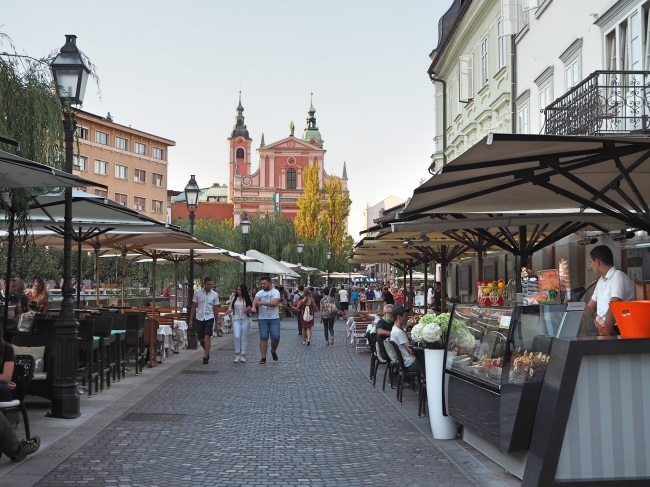 With a population of just 250 thousand, Ljubljana is small for a European capital but what it lacks in size it certainly makes up for in charm. 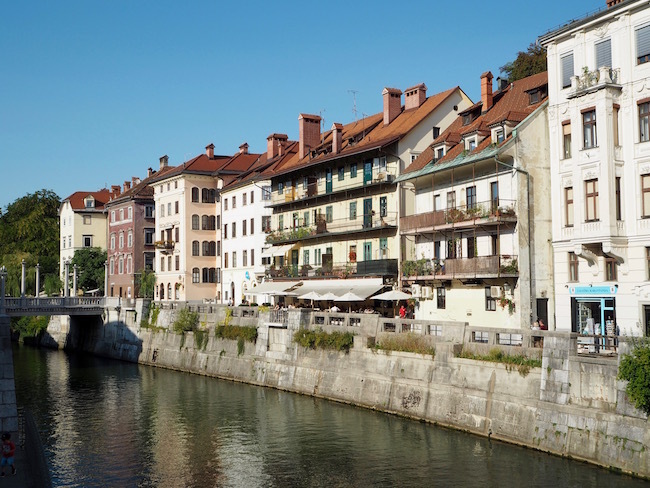 Seated on the Ljubljanica river, its streets are lined with chilled-out cafes, laid-back restaurants and a mixture of baroque facades and twentieth-century buildings. It is a delight to wander around. Start with a walk around the river. It runs through the heart of the city and is one of Ljubljana’s most notable landmarks. Strolling along the riverside promenade in the late afternoon was incredibly relaxing. The river has a number of distinctive Plecnik-designed bridges, the most famous being the Triple bridge. A symbol of the city, the Triple bridge is a popular hangout for locals and is also popular with tourists. It is probably one of the most photographed sites in Ljubljana, which actually makes it difficult to photograph! 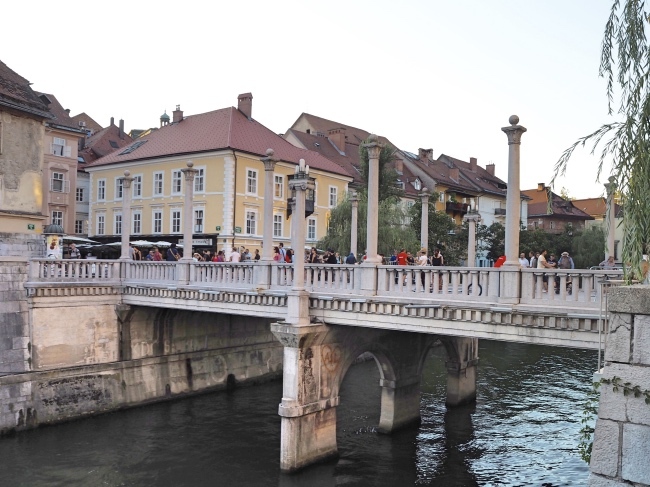 The bridge is formed from three separate bridges which together connect the city centre of Ljubljana to the Old Town. Many other bridges dot the river such as the beautiful Cobblers’ bridge also called the Shoemaker’s bridge, and the Dragon bridge with its large dragon statue (the dragon is the emblem of the city and you’ll see it used everywhere). Not as pretty but definitely interesting is the Butchers’ bridge. 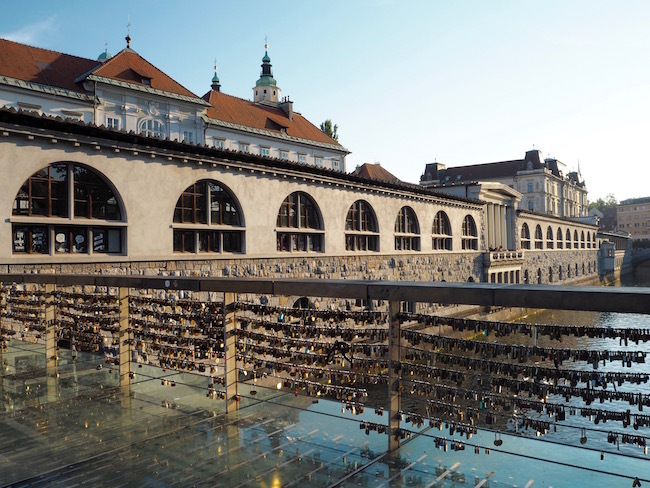 The Butchers’ bridge is Ljubljana’s version of a love bridge where couples attach padlocks with their names onto the bridge in the hope of having everlasting love. Unfortunately, the name of the bridge and the many weird sculptures along it are far from romantic! Cobblers’ bridge also called the Shoemaker’s bridge. Butchers’ bridge and its many padlocks. If you have an hour to spare and you want a guided tour of the river, hop on one of the many tourist cruise boats to get some picturesque views of the river and the historical centre. A boat cruise on the Ljubljanica river. The old town of Ljubljana is found on the south-east side of the river. 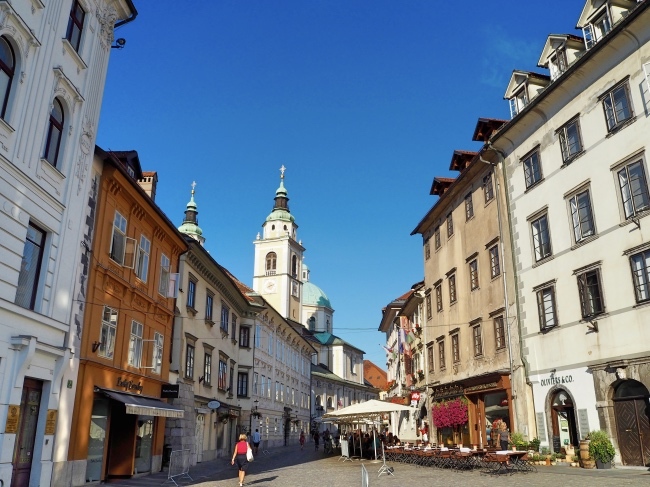 In this part of the city, you will find the most important historical buildings including the Ljubljana Castle and the Cathedral of St. Nicholas. It’s a great area to walk through with many pedestrian streets, colourful buildings, beautiful plazas, souvenir shops and many restaurants. The old square or Stari Tag is located in the very heart of the old town. This square is a great place to visit to admire the architecture of the historical buildings. Walking through the streets of the old town. The Cathedral of St. Nicholas is worth a visit even if you are not keen on churches. It has beautiful original Baroque decor and frescoes inside. The best thing about this Cathedral, however, is its entrance. 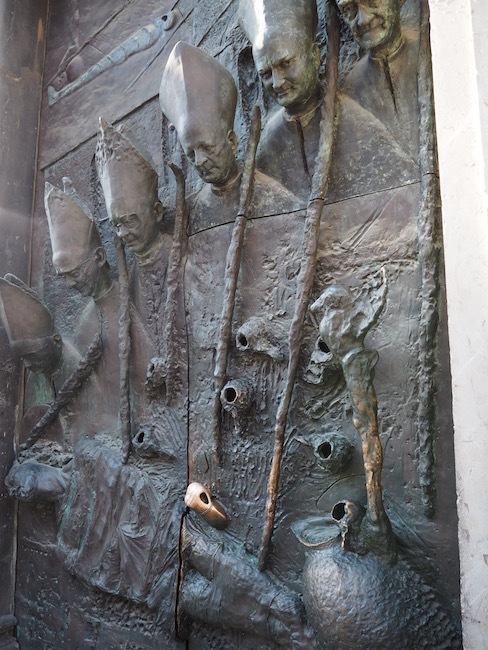 Made especially for the visit of Pope John Paul II in 1996, the front door has a unique bronze casting showing a depiction of Slovene history; and the side door has portraits of the 20th-century bishops of Ljubljana. Portraits of the 20th-century bishops of Ljubljana on the side door of the Cathedral of St. Nicholas. 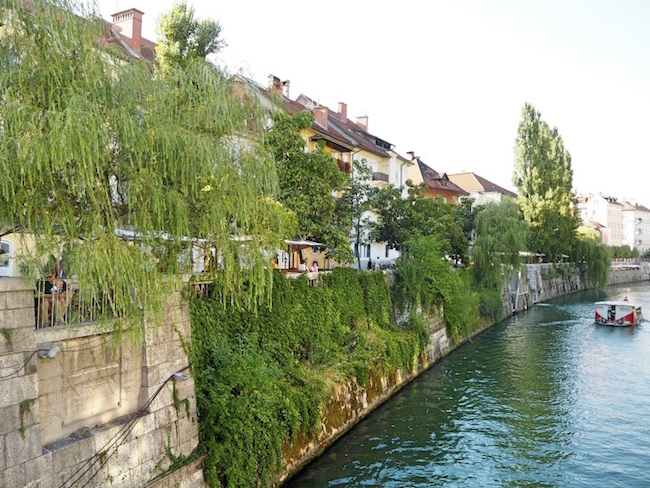 On the other side of the river to the old town, you will find the city centre of Ljubljana. 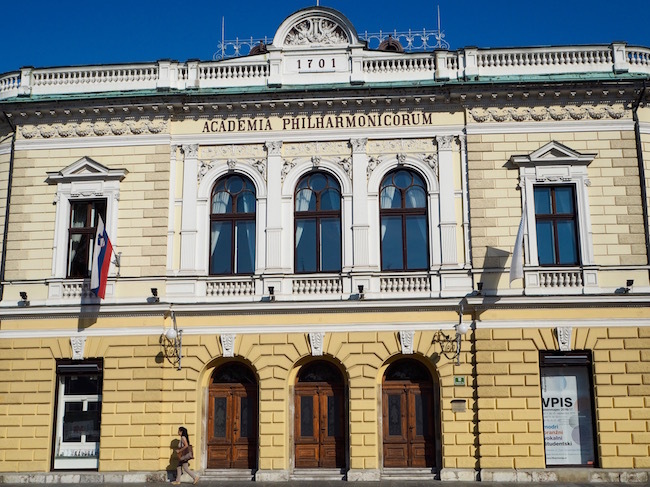 While not as old, it still has beautiful architecture with impressive buildings such as the Slovenian Philharmonic Hall, the Slovene National Opera and Ballet Theatre, the National and University Library, the University of Ljubljana’s main building and many more. If you like museums the City Museum is a great place to visit to find out more about the city. Prešeren Square is the centre-point of the city with the beautifully restored pink Franciscan Church of the Annunciation and a statue of the poet Prešeren overlooking the square. The Triple bridge will lead you straight onto this square so you can’t miss it. From the Prešeren Square, you can get great views of the castle up on the hill. 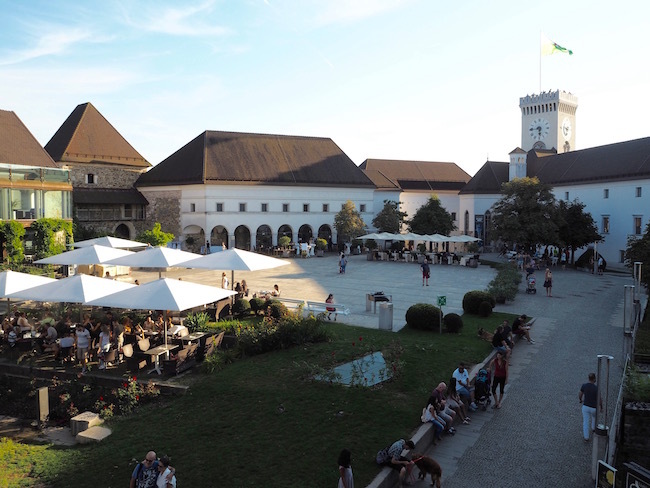 A trip to Ljubljana is not complete without a visit to its imposing castle sitting atop Castle Hill, a forested hill behind the old town. To get to it take one of the several paths leading up the hill. If you are in a hurry or don’t fancy the exercise, take the funicular from Krek Square. The funicular will take you up to the castle in exactly one minute for a cost of 2.20 euros one way or 4 euros return. Reaching the castle you will have a lovely view over the city and the Ljubljanica River. Entry to the courtyard is free but it costs 7.50 euros if you want to go inside the castle and climb the watchtower for an even better look over the city (or 10 euros including the funicular). There are also a few free art exhibitions inside. The penitentiary and the chapel are worth checking out and are both free. If you are hungry, Gostilna Na Gradu is reputed to be the best restaurant in Ljubljana (although we didn’t have a chance to try it this time). Right inside the castle, they only serve traditional Slovenian meals and use the best Slovenian ingredients. We’ll make sure to try it next time! With all that said, however, the best thing to do in Ljubljana is to simply sit back, do a little people watching and enjoy the surroundings. 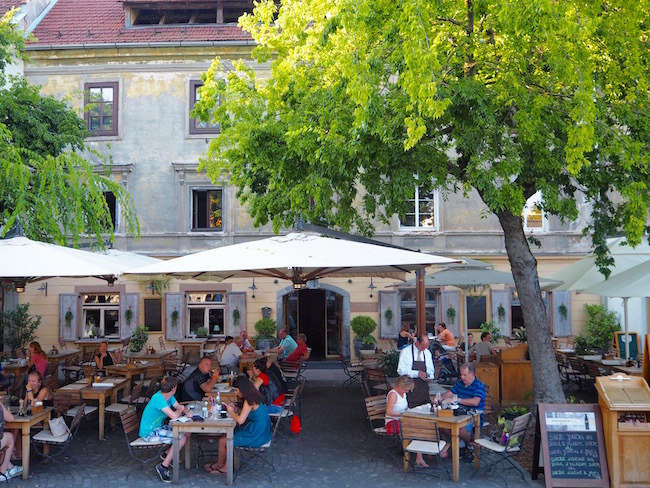 Ljubljana’s cafe culture makes this easy. The city bustles with outdoor cafes all along the river, along with restaurants and beer gardens. The hardest choice will be where to go! One of the many cafes in Ljubljana. 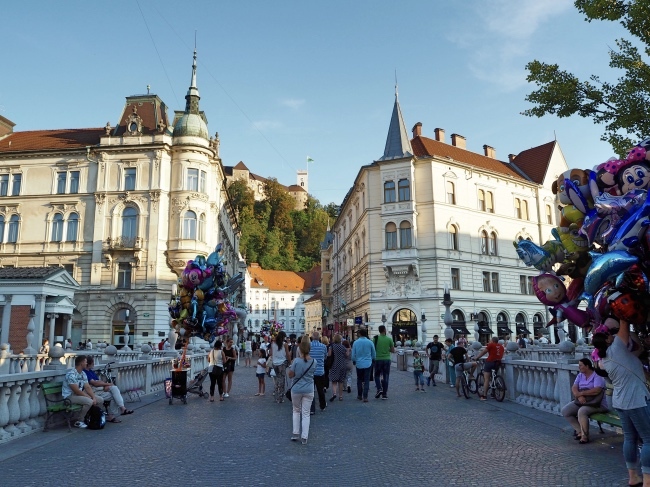 So take a break from Slovenia’s beautiful lakes and mountains and visit its stunning capital. We weren’t expecting much but we were very pleasantly surprised and will definitely be back again. Next time we will stay for longer and really soak up the atmosphere of this beautiful city. Thanks for sharing this, Simon and Cindy! 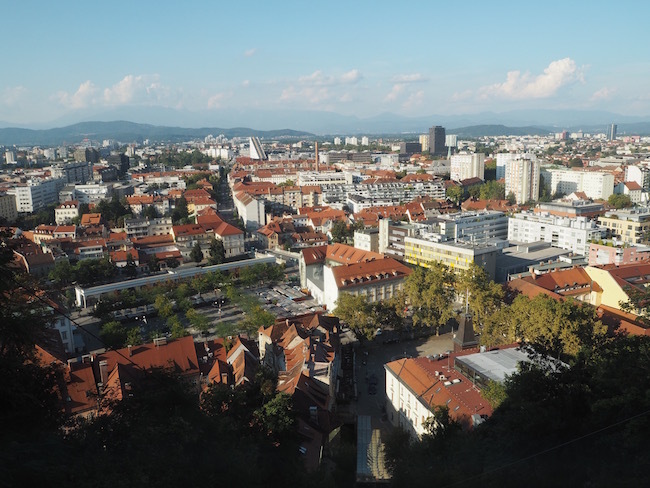 I rather unexpectedly spent a month in Ljubljana this past fall and absolutely loved it! Where were your favorite places to eat? I wrote about a couple of my favorites here: http://authentictraveling.com/live-like-a-local/how-to-guides/how-to-live-like-a-local-ljubljana-slovenia/ I’d love to know what you think. Hi Andrew, Thanks for your comment. Wow one month in Ljubljana, that sounds really good. We were only there for a few hours so unfortunately we did not really have time to try many food places. We would love to go back one day though and stay for a few weeks like you. It was such a lovely place with a very nice feel to it. Your blog is really good, we will have to try those places next time! The escape room sure sounds interesting!